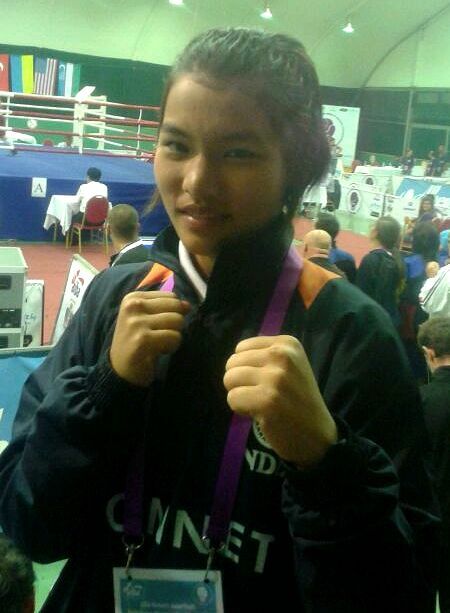 14 year old junior boxer Asha Roka (48kg) powered through to the semi-finals of the AIBA Women's Junior World Boxing Championships on Wednesday (25 Sep 2013) in Albena, Bulgaria. The reigning national champion was the first Indian to make it to the penultimate round of the Championship, after seven other Indian boxers – including three from the Junior Group and four from the Youth Group – secured their place in the quarter-finals of the event. Roka a gold medallist at the 2nd Nations Cup, an International Boxing Tournament in Zrenjanun, Serbia made her place in the quarters beating Osormaa Sarantsetseg from Mongolia. The light fly weight boxer from Madhya Pradesh was at her superlative best as she devoured the Mongolian boxers by virtue of a unanimous decision from the Judges. In the round of eight she locked horns with Malika Abdi from Algeria. The Algerian boxer threw some good straight punches in the beginning of the bout, but Asha came back strongly giving a good account of her boxing skills to edge past Abdi in brilliant fashion. In the semi-finals she takes on Assyl Askarova from Kazakhstan. Earlier in the Women Junior World Championship Gargi (50kg), Likhitha Battini (52kg) and Siwi (60kg) cemented their place in the quarter-finals of the event. All three Junior boxer put in a stunning performance to overhaul their respective opponents. Gargi, a silver medallist at the 2nd Nations Cup, needed only one round to upstage the lone Maldivian boxer in the competition; she beat her by a technical knockout (TKO). The 16 year old is slated to play Ebonie Jones from England in the quarter-finals. Similar to her fellow compatriot Likhitha too, got rid of Uzbek boxer Azizabonu Mamirova by virtue of a TKO. She will now fight against Santiana Meurant of France for a place in the semi-finals. In the light weight division, playing her first international tournament Siwi displayed great potential as she beat Uuriintuya Gantulga of Mongolia in a hard fought contest; The 14 year old eventually won the bout by a split decision. Her next opponent is Esra Yildiz from Turkey. Indian glove women made headway in the Youth group of the World Championship as well. Reigning Junior World Champions Lalenkawli (48kg) and Nikhat Zareen (54kg), both of whom have now advanced to the Youth level of the game, made it to the quarter-finals of the Championship putting in a dominating performance in their respective bouts. Lalenkawli, a feisty and upcoming boxer from Mizoram, took on some solid attacking from Kristina Elizabeth O'Hara from Ireland. But the 18 year old was up to the task as soon put O'Hara on the back foot by her incessant flurry of right and left jabs. She went on claim the quarter-final spot with a win on a unanimous decision. Zareen also won with a unanimous decision against Romanian Mera Ioana-Lavinia. Lalenkawli will stake a claim for a semi-final against Venelina Valentinova Poptoleva from Bulgari, while Zareen goes up against Italian Desire Galli. Simranjit Kaur (60kg) and Shashi Kala (64kg) too won their pre-quarter final bouts to march into the round of eight. Kaur now takes on Justine Moerl from Germany while Shashi is slated to fight Airiken Subinuer of China.